Eight weeks ago, physicists announced that they'd discovered evidence of gravitational waves in the early universe, potential proof that our universe began with a bang and inflated from there. But the most significant cosmological discovery in years might just be an experimental artifact. Back in March, Harvard professor John Kovac and his team announced to the world that B-modes of gravitational waves had been observed via the pinwheel-like swirls in the polarization of the cosmic microwave background radiation, or afterglow of the Big Bang. These swirls, which are traces of waves rippling through spacetime, were captured by the Background Imaging of Cosmic Extragalactic Polarization 2 (BICEP2) telescope. It's considered the best evidence yet that our universe was formed when very rapid expansion — the Big Bang — kickstarted the inflation process which produced the universe and everything we see within it. 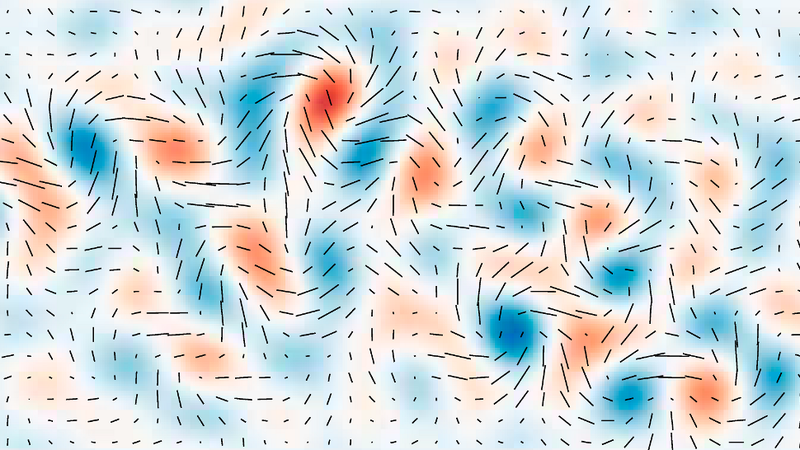 Physicists had encountered gravitational waves before, but B-mode polarization is a horse of a different color; they're the gravitational waves that are supposed to have peaked during the first 10-34 seconds of the universe. They're the so-called "smoking gun" of inflation. The BICEP researchers mapped the polarization of the CMB across a patch of sky measuring 15° by 60°. To study the CMB signal, however, they first had to subtract the "foreground" of microwaves generated by dust within our galaxy, and the BICEP team may have done that incorrectly, Falkowski reports on his blog today. To subtract the galactic foreground, BICEP researchers relied on a particular map of it generated by the European Space Agency's spacecraft Planck, which mapped the CMB across the entire sky from 2009 until last year. However, the BICEP team apparently interpreted the map as showing only the galactic emissions. In reality, it may also contain the largely unpolarized hazy glow from other galaxies, which has the effect of making the galactic microwaves coming from any particular point of the sky look less thoroughly polarized than they actually are. So using the map to strip out the galactic foreground may actually leave some of that foreground in the data where it could produce a spurious signal, Falkowski explains. "Apparently, there is something that needs to be corrected, so at this point the BICEP result cannot be taken at face value," he tells Science. According to Cho, the BICEP researchers are standing by their paper. They admit, however, that the foreground map is an important and thorny issue, but that they will not be revising or retracting their work. The issue could be resolved later this year when physicists get a chance to see Planck's final map of the galactic foreground — a result that could make the BICEP signal go away. Read Cho's entire article here, and Falkowski's here.